No no no noo NO! Dear Today, You were Awesome! The mental alarm rang before the phone alarm. I was up before time. A little sleepy, a lot tired.. That’s how I felt but there were good vibes about today. Happy vibes – a little weird since it was a Monday. Usually Mondays are hectic and tiring and boring and loaded with work. I ran around happy, working. 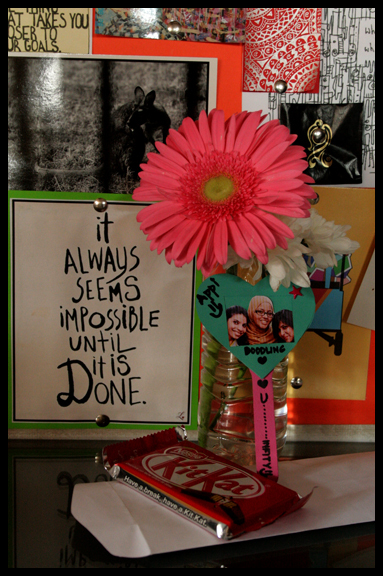 A lil while later Mariam comes in with kitkats. I mean what IS happening today. Ohkay so mariam and I had a deal and she owed me kitkats. Yes I like kitkats 😀 so today was the fortunate day when I got kitkats too. Sweet of her, she packed them nicely, doodled on a card and attached it with it. That made my day too. 10:30am Check!! I had confirmed A that I’ll buy the tripod she was selling. I had plans of picking it over the weekend but she had a busy Sunday. She called and said that she can drop by Indus to hand over the Tripod. Hell yea! I got the tripod too. Allah Mian, yeh kyaa hora hai. So many khushiyaan! Alhamdolillah. Got a Chance to have a chat with Choti after a looooong time. School bonding sessions are just different. Love u Choti. I come back to my cubicle and I see a ‘heart shaped’ bookmark stick from Khadija. I mean these girls just made my day complete. Today was just different. It was an Awesome day. I’ve always been very average at Math or I’d like to think. Till studying math as a subject was a compulsion at school I did so, but as soon as we got a choice. I chose pre-med and studied biology and NOT math(i loved biology). I just fail to understand or rather I just fail to concentrate on them problems sums and stuff. I haven’t been able to gather enough courage to apply for the GRE because of this. 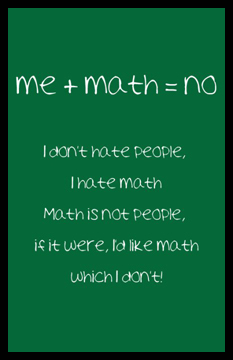 *sigh* So there is some problem with me going along with Math. Soo something really funny happened. No offence whatsoever to my client-friend-baji. She planned on ordering something from my studio aka Ghazal Pirzada Creative Studios and the amount that I calculated came out huge. And when I say huge…. I mean it. I agreed to do the project though I knew I was short on time. So she came, saw the samples and loved them and agreed with the entire deal. We were at that stage where she said that she’ll send in some advance the next day and I could start then. And the amount she had in mind was 10% of the ‘huge’ grand total. She got bedazzled by what she saw on her phone calculator. Turned out she miscalculated and the deal went out of budget for her. She made a big booboo. All I could ask myself was… Did I just find someone who is actually bad with math? Dayem!!! I came home and the thought of what happened made me laugh. I was in fits. So..does anyone know what happens when u multiply trillions to millions and then the same to billions?? ?